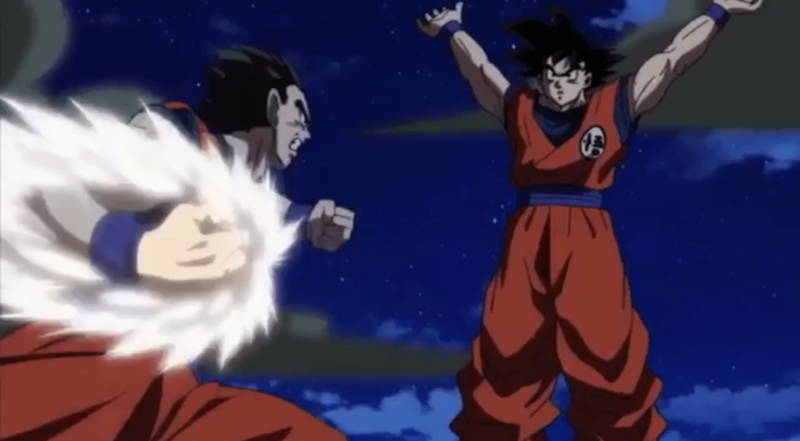 Last week’s episode of Dragon Ball Super, to some, might have been a lackluster, especially because we had just left off with Gohan tapping back into that dormant ultimate power he on each had. Despite the dry episode that reintroduced Rossi & Tien into the spotlight, we were teased with an episode that will have Gohan & Piccolo squaring off against Goku & Tien. It doesn’t take long for this episode to pick up. The episode starts off letting us know that sometime has passed between Gohan reawakening his ultimate form. Piccolo tells Gohan that his training of Gohan has reached his end & that in order to know how much his power has grown since his training with Piccolo, he’s going to have to go toe-to-toe with Goku. After finding Goku, Tien, Chiaotzu & Rossi hoping down at a restaurant, Gohan challenges Goku & Tien to a match to see how string he’s become. Gohan’s confidence has definitely boosted up a notch & it showed by the way he walked into the restaurant & challenged his father. This is a Gohan that fans have been craving to see again. His overall attitude is more warrior-like with the familiar humble covering. The battlegrounds are in the same mountainous area where Piccolo & Gohan were training, but the ring sits on top of a very large, flat rock formation. Tien came off a bit cocky when he told Goku that they should try to hold back & not hurt Piccolo & Gohan. I mean, sure, Tien somewhat saved Gohan during the Super Buu arc, but he knows that he was nowhere near Gohan’s level. I also understand that he was closer in strength or somewhat stronger than Gohan during the Resurrection of F arc, but he was way overconfident to assume that he was dealing with the same Gohan. But his overall look at this sparring match changed when he sensed Gohan & Goku’s fighting spirit rise to a point where a playful match was definitely out of the question. Besides Gohan taking up every highlight in this episode with his physical prowess, we got to see his new technique that definitely reminds me of Gogeta’s Stardust Breaker attack. If you’re unfamiliar with Gogeta or the attack, Gogeta’s first appeared in Dragon Ball Z: Fusion Reborn & he used the move to defeat Janeba. Gohan’s new skill isn’t an rainbow orb, but the energy particle that he released from his finger reminded me of that move. This could be a spin-off of Piccolo’s infamous Special Beam Cannon, especially since it was released from Gohan’s index finger. & is it me or did Gohan seem to have something against Tien? Maybe he overheard him underestimate him earlier, but it was hilarious to see Gohan all over Tien. The battle started go get out of control once Gohan annihilated the arena. Although Tien wanted to call it quits, especially after being smashed around by Gohan, Gohan still wanted to fight his father one-on-one, in an serious no holding back battle. Goku accepted Gohan’s challenge & an all-out battle commenced. At first it Goku powered up to his Super Saiyan 2 form & Gohan maxed out in his a Ultimate form, but Gohan knew that Goku was still holding back & demanded him to change release hiscreening full power. I did like that Gohan broke down whyhe didn’t want to transform into his Super Saiyan form, but most longtime Dragon Ball Z fans came to this conclusion in the 90’s. The conclusion of the match came when Goku transformed into his Super Saiyan Blue form & then kicked it up with his Kaio-ken form. The final hit was off-screen but the winner of the match was a given. An interesting turn of events came when after Goku & Gohan fought, Goku told everyone there that Gohan would be the leader of Universe 7’s team. I would’ve thought Piccolo or even Rossi, but I guess this was either Goku rewarding Gohan for the match or because he saw something new in Gohan. This was another solid episode from Toriyama. The last time we got to see Gohan & Goku genuinely train together was when they were in the Rokm of Spirit & Time in the Cell saga, which is why this episode meant a lot to longtime fans like myself. I also enjoyed Goku’s talk with the unconscious Gohan. Goku told Gohan that he wants them both to move forward together, in strength. Since Dragon Ball Super is closing in on the end of Dragon Ball Z, it will be interesting to see if Toriyama shifts the climax of Z around & continues Super with Gohan holding down the fort while Goku trains Uub. Even though it broke up the fluid battle between Gohan & Goku, we did get to see God of Destruction Rumsshi’s fighter, Murichim, who seems more of a blockhead than a solid fighter.